Winemaker’s Notes: The wine’s colors are a lovely purple-red, with dark, violet hues. The aromas are filled with wild strawberries, red currants, and exquisite scents of raspberries. On the palate, the wine is delicate, full-bodied, and delightfully rich. Pairs beautifully with a range of foods, from casual dishes to holiday specialities like turkey and ham. My Review: It’s almost upon us – Beaujolais Day. The third Thursday of November is set aside to welcome the first release of the year, which this year just so happens to fall on my birthday (November 20). 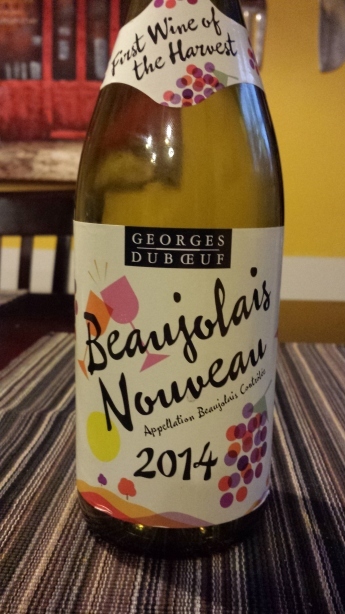 So, in anticipation of the day, here’s a preview of the new relelease of Beaujolais Nouveau from Georges Duboeuf. In the glass the wine was fairly dark, with some slashes of violet. On the nose I picked up strawberry and raspberry, while in the mouth strawberry and red currant were big and juicy. While the winemaker make call this full-bodied, it skewed a bit more towards medium-bodied for me, which isn’t a terrible thing, just worth noting that this isn’t going to be a big, full-bodied wine if that’s what you’re looking for. Paired up with a lunch that included a brie and sun-dried tomato dip with some leftover roasted chicken salad, the wine did a nice job of providing a bright, fruity counter-note to the richness of the cheese in particular. While this is by no means a revolutionary wine, it is a very serviceable “table” wine (not getting into the semantics or legalities of what is technically a table wine; that’s a post for another day) – good for a variety of meals, but by no means that special bottle you pull out to celebrate an anniversary or wedding. Still, at $11 it’s not a bad value, and certainly one I’d give a passing consideration to if I was looking for a bottle of versatile red on the shelf. Hope everybody has a fun Beaujolais Day, and if you are trying it out, feel free to share what you think about it.